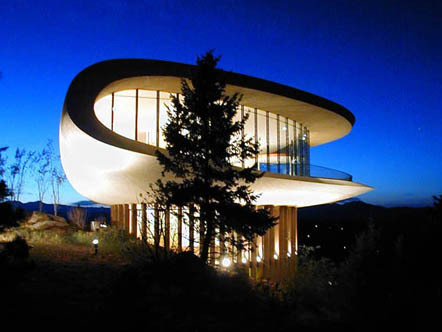 Hovering high above I-70 in the foothills of Denver is the famous landmark, the Sculptured House. Originally built in the mid-1960's by architect Charles Deaton, the home is internationally recognized as one of the finest examples of modern organic architecture in the world. The original shell shaped structure was recently finished after sitting vacant for 30 years and a 5,000 square foot addition, also designed by Deaton, was added. It includes a state of the art stainless steel and granite kitchen. A four car garage connecting to a 1,015 square foot guest or caretaker's apartment that is complete with it's own kitchen. The original structure has a circular elevator made famous in Woody Allen's movie Sleeper that reaches five levels with 3 bedroom suites, a living room, wet bar and large deck off the master. 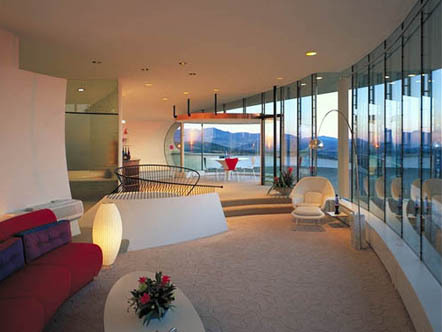 The Sculptured House is offered with the owner's collection of the finest modern furniture. 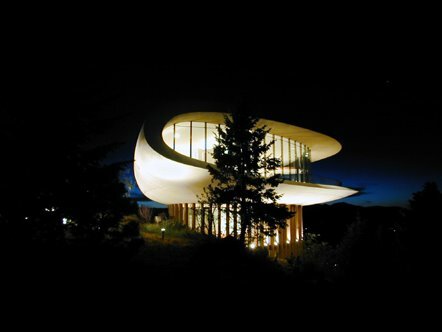 Together the furnishings and the house combine to make an inhabitable work of art.